If you are planning to use the mobility coach for any forthcoming fixture please contact the club as early as possible,preferably at least 3 weeks in advance of the match, on 03330 14 44 44. As DJ Coaches need to arrange to remove 4 seats for every wheelchair place, the latest time to book these places should be on the first day of tickets being made available for purchase. The Valley Away service is organised by the club and the coaches run from a number of pick-up points across the South East to away matches. 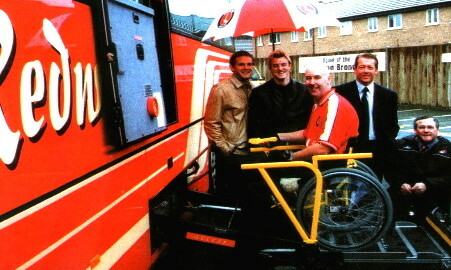 Some coaches with lifts are also provided to cater for the club's disabled supporters where sufficient interest is shown for a particular match. If a fixed wheelchair space is required, or if you can transfer from your wheelchair to a seat on the coach, please contact the Valley Away office as early as possible to book your places as the seating on the coach will need to be reconfigured to accomodate the wheelchair spaces. Wheelchair users who can fold their chairs and store them on the coach, as well as ambulant disabled passengers, can use the standard coach service if they have no problem accessing the coach via the front doors. In these cases requests for seats near the front of the coach should be made when booking tickets. Disabled supporter's carers can travel for half price when accompanying that supporter. Details can be found on the Valley Away page or from the Commercial Centre on 03330 14 44 44. The Charlton Athletic Supporters Trust are also running coaches to most of the away matches this season. Phone 07581 300764 or contact secretary@castrust.org to book. Please note that wheelchair users will need to give plenty of notice to purchase a coach space. Information on rail travel for each away game can be found on the News page of the Official Website. Supporters should contact the rail company being used to confirm that ramps are available, if required. as well as confirm with the rail company that your carer can either travel free or at a reduced rate. Some useful train travel information may also be found here. Have a look on www.railcard.co.uk/ for discounts on train travel. Most are a year long, and save you a 1/3 on all journeys. 16-25, 2 together and disabled railcards are self-explanatory. Senior railcards are for people 60+, plus family and friends can be used for a group of people. It would be best to buy as early in the season as possible. See League One Clubs page for further information.